Two drawings of rock cut carvings at the Lomas Rishi Cave, Barabar, Gaya (Bihar). One shows the cave's entrance and the other shows a relief of three men in a boat. bl.uk > Online Gallery Home	> Online exhibitions	> Asia, Pacific and Africa Collections	> Two drawings of rock cut carvings at the Lomas Rishi Cave, Barabar, Gaya (Bihar). One shows the cave's entrance and the other shows a relief of three men in a boat. The Barabar Hills are home to a group of cave temples which date to the Maurya period or the third century BC. They represent some of the earliest examples of rock-cut architecture in India and were used by Jain monks as a retreat. 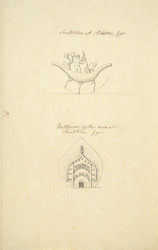 The lower drawing depicts the entrance to the Lomas Rishi cave which has a very elaborate doorway imitating the elevation of a hut with sloping timber supports, curved eaves and a pot finial. The curved architrave is sculpted with a frieze of elephants proceeding towards stupas. The interior of the cave consists of an oval chamber with a dome roof entered through a rectangular vaulted hall. The top drawing reproduces a sculpture of three men in a boat.